Author’s note: Since no two ultrarunners are alike and the events to choose from are so diverse, it’s nearly impossible to assign numbers to long run length and frequency that will work for everyone. Instead, this column provides a general framework and suggests how to approach and reach your maximum training potential. The long run: It’s the chance to spend hours on your favorite routes and do what sets us apart from most other runners: run far. Elite marathoners seldom run more than 24 miles in one session, but ultrarunners typically run farther than that on a regular basis. There are three endurance-based workouts that can enhance your staying power over ultra distances. Before diving into the specifics of the long run, let’s first discuss the two shorter, often overlooked, endurance-based workouts: easy runs and recovery runs. Easy runs maintain and maximize your aerobic fitness. Most runs within a given week fall into this category. They are shorter than 90 minutes and are done at an easy pace. Yet, many runners fail in their training by running these too fast. Though the pace should be steady, you should still be able to hold a relaxed conversation and maintain your heart rate below 75% of maximum. Recovery runs assist with the recuperation process between tough efforts. They can be used for the rest periods between taxing intervals or on the days following rigorous workouts, including a long run. They are purposely short in duration and kept at a very slow pace. These “jogs” are a form of active recovery where your heart rate should be kept below 65% of maximum. The long run is the most crucial of the three workouts for ultrarunners. It enables you to build a strong fitness base, run farther than previously possible, and, in turn, boosts race-day confidence. Become more efficient in amassing muscle glycogen, the major form of stored carbohydrates in the body. The pace should be easy, but the effort consistent. Depending on the terrain and your ability, short walk breaks may be necessary to keep your heart rate below 70% of maximum. 2. Carbohydrate Depleting Long Runs: I recommend you do this workout first thing in the morning, because only water (coffee or tea without sugar or creamer is also allowed) and electrolytes are permitted until the run is complete. This technique teaches the body to use fuel stores more sparingly and perform more efficiently on low blood sugar. These runs are very taxing on the body and spirit, and should therefore be limited to training runs that are 3 hours or less and placed three or four weeks apart. Their use is practical in early season training when weekly intensity levels are low. 3. Fast Finish Long Runs: These workouts are the exception to the typical long run theory that time on feet is all that matters. They are the most challenging component of our endurance-based training. Just as the name implies, the goal is to finish fast or with a high level of perceived effort. These runs make you a stronger runner, build your confidence, and become race-day habit forming. Due to the amount of energy expended on the back end, fast finish sessions are slightly shorter than the standard long run. The workout begins at the aforementioned steady long run pace (conversational) but you increase the effort and/or pace to near marathon race intensity (roughly 80% to 85% of maximum heart rate) toward the end. For “newbies” or early season training, the fast finish portion can range from 2 to 3 miles. For more experienced runners and peak season outings, the fast finish can increase to as much as 8 to 10 miles. Keep in mind that if you are training on hilly or technical trail, aim for marathon “effort” as marathon race pace will be too difficult to sustain. a. The Western States 100 Mile Endurance Run Memorial Day weekend training camp comprises three consecutive long runs totaling nearly 70 miles on the actual race course. b. Do a steady long run one day followed by a fast finish long run the next. This is especially challenging because you will be running hard the second day on fatigued legs. For experienced ultrarunners, participating in several ultra events in lieu of solo steady long runs or fast finish sessions can prove beneficial. If you choose this approach, you must be careful to truly treat the races as training runs and not all out efforts. For example, take Scott Jurek’s masterfully crafted buildup to his June 2004 Western States 100 Mile Endurance Run victory and course record. In March, he began his season with the Way Tool Cool 50K Endurance Run, in April, he tackled both the Zane Grey 50 Mile Endurance Run and the Leona Divide 50 Mile, and in May, eight weeks before Western, he ran the Miwok 100K Trail Race. By never losing sight of his true objective (Western States), Jurek turned four classic trail races into perfect training efforts. According to numerous online dictionaries “long” is defined as: extending for a considerable distance. However, glance a little lower in the list of definitions and you find terms that describe what “long” can become if you aren’t diligent with training or maintaining self-control: tedious, subject to great odds, having excess, or stressed. In order to avoid the latter, understand that distance is a relative concept and varies for each individual. Literature suggests that the minimal distance of a long run for a trained athlete begins at approximately 90 minutes, when the use of the body’s glycogen stores becomes stressed, but injury and over-training risks are low. Ultrarunners push this envelope repeatedly. When do the risks begin to outweigh the benefits as the length of these runs increase? To determine the most advantageous distance a given runner should cover during a long run several factors should be weighed: running experience, injury frequency, age, and the target race. First time ultrarunners with limited to no marathon training should save their ultra debut for race day. A conservative approach will allow for an uninterrupted, injury-free training cycle, and allow first timers to toe the starting line with the best chance for success. Runners who have completed several successful ultras and have a year or two of consistent ultra training volume under their belt can and should explore more aggressive long run distances, fast finishes, and back-to-backs. 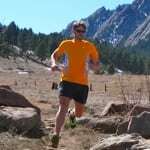 Runners who fall victim to persistent or reoccurring injuries with high volume training due to improper technique, scheduling, or biomechanics should take a conservative approach with their long runs. In this case, less is more. Starting a race 80% to 90% prepared gives you a better chance of finishing than being unable to participate due to an injury sustained during an aggressive training cycle. Author’s note: Ways to correct some of these issues will be covered in subsequent columns. Some of the most competitive ultrarunners on the circuit today fall in the master’s category. Though they rack up impressive race results and complete some fantastic training sessions, they need more recovery than do their 20-something counterparts. “Short” events, like 50Ks, don’t require the massive hours of weekend training or potentially stressful back-to-backs as do the longer ultras. Getting the hang of this “shorter” distance is a good starting point for the ambitious ultrarunner who wishes to progress to 50-mile, 24-hour, and 100-mile events. a. The concept of time vs. mileage: Mountain and trail running is relatively slow-going, so running for time alleviates the pressure of having to cover a predetermined mileage. b. Adjust the length of the long run to gel appropriately with your most recent (roughly the last ten weeks) training load. c. The frequency of tough long runs can be altered. Don’t be afraid to extend the typical 7-day training cycle. Many runners have been successful with a 10-day or 14-day long run rotation. d. Training on the same terrain as your race is key, but don’t let terrain specificity rule your long run location choices. Variation in topography allows for both mental and physical reprieve. e. Scheduling a recovery week every three to four weeks, where the long run’s distance is cut almost in half, allows the body to absorb recent training while preparing for the subsequent weeks’ long run. Keeping in mind the above considerations, each runner can adjust their own training to fit their specific needs and ability levels. The long run progression isn’t just a seasonal concept; it is a life-long endeavor. The volume and intensity of your long training runs can and will increase as your body adapts to the workload over the years. How do long runs fit into your ultra training? Do you run any back-to-back, carbohydrate-depleting, or fast-finish long runs in your training? If so, how? Are you able to run long races as training runs without “racing” them? Have any questions about the place of any of endurance-based workouts in your training? Nice comprehensive article of the long run and long run strategies. The "fast finish" or "progressive run" is one of my favorites but seems to be highly under rated possibly because it is difficult to coach and it requires diligent effort and practice to do it effectively. Your article is a keeper. Thanks! Excellent article. It would be interesting to here your views on coping with the mental fatigue of long runs. I read that people like Killian 'trick' their minds. How is this done? Thank you Ian. I have printed this out so I can re-read this and pass along to a few others I know. Great stuff. Thanks Ian and Bryon. So happy you have added these to the iRunfar suite of resources. Bryon – I have another suggestion for iRunFar: What about a forum or message board? I know other such things exist for runners but I think an UMT specific message board/forum could be very beneficial and since IRF has become the site of record it seems like appropriate location for such a thing. I have a ton of specific questions that I would like to throughout there and have no idea where to send them. An IRF message board/forum would be the ideal place. OK – I am stupid. There the forum is at the top of the page. Perhaps another suggestion: A way to delete your previous comment (that too probably already exists and I am just missing it)! Some questions, if I may. (1) You define an Easy Run = <75% maximum heart rate. But when 80-83% of maximum is still (truly) "conversation pace" is that still too hard for an easy run? (2) As the temperature increases, so do our heart rates. From my experience in heat, my perceived effort does not increase as quickly as my heart rate. Does the Easy Run definition still apply? Or does the % of maximum heart rate increase? (3) What are the (short- and long-term) detriments of not doing enough easy and recovery miles? Note: I understand people vary greatly, and that the percentages (e.g. 75% of max HR) can differ, too. But by how much the latter can vary, I have no good idea. Thank you for these articles, Ian! Absolutely awesome explanation and lay out in plain English (something I struggle with:)). I have a few questions with so-called depletion runs. First, are there any scientific studies to support the claim that exercise without carb intake actually improves fat utilization? We know that even at low efforts the body needs carbs to burn fat. Second, we also know that when depleted the body will break down protein (i.e. muscle) for fuel. So to what extent does one risk excessive muscle damage during these runs? Third, don't they violate the rule of specificity? While I agree there is psychological value in learning how to run while feeling hypoglycemic (been there, done that! ), during a race I'm going to be taking in 200-300 calories per hour. If I may…A good summary of this strategy is in a May 10, Running Times Article: "Running on Empty". Increasing ones ability to utilize fat as fuel is in my view the single greatest factor in improving competitiveness in Ultra's 50m and longer. 1) Fat fuel generates less lactic acid that glycogen fuel; 2) Conserving glycogen stores ensures that you'll have the higher octane fuel when needed to accelerate when needed during a race; 3) but most importantly and obviously, without increasing our utilization of fat as fuel, even a trained athlete will not be able to absorb enough fuel (200-300 calories per hour max), to sustain a race effort that may burn 600-800 calories per hour over 10, 12, 24 hours. My strategy is slightly different. I recommend consuming about 120 calories and hour before starting the run. Carry fuel with you, but push to 2 hours before supplementing. Then gradually build up 15 minutes on subsequent runs. I can now easily go out for three hours at up to an 80% effort without supplementing (for me that's about a 3-3:10 marathon effort). However, once you start supplementing on a run, I find that if I want to maintain effort, I need to consume at least 80 calories every 30 minutes. I of course supplement when racing, ususually starting at 60-75 minutes and every 30 minutes thereafter. A couple of questions for you! I've been averaging 60 miles a week and do my long runs on the weekends 15-30 miles. I keep bonking about mile 15-25 miles then my energy comes back slowly even in 50 mile races or 50k its like clockwork. I carb load for breakfast and bring lots of water but it doesn't seem to help. Any advice on what to do? Thanks! The carb load you are having for breakfast is causing your sugar levels to spike then crash. I would focus on minimizing your carb intake and utilize foods that have a low glycemic index. +1 — "Carbo loading for breakfast is a big no-no. It creates a massive Insulin surge which is exactly the opposite of what you want to happen at the start of a long run. Try 100-200 calories of easy to digest foods for breakfast, preferably low glycemic, and then just start taking some calories at about 100 minutes into your run (or sooner)." That's what people told me when I was doing what you were doing, Paul, and getting the same bonk you were getting. As soon as I followed their advice, the bonk vanished. What are you training for? Without knowing your goal(s) your training can't be assessed. +1 to this comment. Add "What's your running history/background?" to the list of necessary info. Looks like you're training for a 100 mile race, and probably a sub-2:50 marathoner. I like to emphasize “distance is a relative concept and varies for each individual", since I can't do that much distance. I love the Rest, Long Run, the Rest again. But I also try to do a Rest, Long Run, Long Run, Rest approach. That gives you a good back to back workout. The second run could just be an easy 15 mile run. I hope you are also getting some hill repeats in once in a while, and maybe a track workout during your cycle. I love Tempo's, but not every week as my only speed workout. I actually use Tempo's during taper to keep up quality while reducing my mileage. Lastly, I bet you are doing most of your running on streets (based upon your speed). If you are, make sure you get on trails at least once a week. If you already do, that is great! "…distance is a relative concept and varies for each individual. " from experience, but mainly from listening to pro Track athletes/coaches that much of the potential for injury is when you are pushing mileage beyond what you can handle. If you can handle 80 miles/week they why not do that consistently or with small variation? If you can handle 60 consistently, then some people would argue that going 80/40 would expose you to more injury risk relative to the amount of fitness gained. The middle ground is what Ian is talking about with 3-4 weeks "On" and then a recovery week. So you might go 60, 65, 70, 75, 50 or something like that. I personally feel if you make the swings too extreme you're sacrificing fitness and risking injury. Just my 2 cents. Does the timing of your meal before an ultra race/long run matter? My understanding (and I'm regurgitating what I've read and heard from multiple sources, but have no confirmed this) is that it takes ~ 180 minutes for your blood sugar/insulin to stabilize. Thus the recommendation is usually don't eat 3, if not 4 hours before the start of a race (and thus long training run). I've followed this and it's worked well, even if it seems odd to NOT eat in the morning before an early morning ultra. I pop a gel <5min before the start or mix gels into my water supply so that as soon as the race starts, I'm starting my fueling. A big breakfast before a run can certainly cause an insulin spike which can decrease your ability to utilize fat as a fuel source during exercise (this is not a good scenario) A more moderate breakfast (200-400 calories) including some carbohydrate, fat, and protein should prevent this (I like a banana with peanut butter). I have tested my substrate utilization after a breakfast like this and know that it does not affect my fat burning during running (it's nice to have access to a physiology lab!). I highly caution against taking a gel right before the start, but I highly recommend consuming fuel soon after starting your race. There is minimal risk for an insulin spike during exercise. It's important to practice eating while running, but doing some carbohydrate depleted runs can improve your fat metabolism, just make sure you are recovering well after, some people will note increased muscle soreness after depleted runs, potentially due to some muscle breakdown or just inhibited recovery post-run. I come from the MMA world and the same principles applied when it came to weight cut and training. Thanks for the advice I will switch my diet up! Hi Mark, so I take it you're saying you're convinced that this is a good method for increasing your body's ability to primarily burn fat *over and above* how long runs while taking in calories increase your body's ability to burn primarily fat? I'm kinda in Jacob's camp where, while I don't doubt that it may increase your ability to burn fat, you are paying a price for it in terms of cannibalizing your muscles, beating the crud out of yourself, probably worse workout recovery (as compared to if you were eating during the run) due to the stress on the body, etc. So those negatives have to be weighed against the ultra runner status quo of fueled long runs which definitely does increase your fat utilization abilities. Can you speak a bit more about your personal experiences? Meaning: did you used to do it the fueled way, and have now seen benefit with the starved method you talk about? I have to admit doing a 3 hour run starved at 80% effort is pretty impressive. You think the pros of that are worth the cons of the stress on the body? I'm really interested in this comment thread. I'd love to hear more on the breakdown of muscle tissue issue. I've never done depletion runs and I don't intend to but this isn't based on any knowledge just on personal preference. on the Marathon talk podcast matt Dixon (the guy that helped Ryan hall to the 2:04 in Boston) says that one should "wrap" a workout in carbs to gain the most from that workout but also so that the diet for the rest of the day can be more focussed on protein, good fat, and essential vitamins and minerals. When I first started training for and running marathons in the late 1970's early 80's, there was no gu or gel. We didn't eat anything during training runs of 2-3 hours, though we would sometimes stash bottles of gatorade. By necessity we were training in a somewhat depleted state, and 'the wall' some 2-2:30 into a race or training run was a real barrier. In that era, I was running 90-100 miles per week, and had several marathons in the 2:33-34 range. I took a decade long break from racing. When I returned to the marathon, and then triathlon's and ultra-marathon's in the 1990's, I was always fueling. It seemed like the miracle cure to the wall. And as long as I had access to fuel, and my stomach was cooperating, everything was fine. In the last decade I've begun racing ultra runs and MTB races of 10 hours or longer, and I've found that 'supplementing' is not always enough, and can't always be counted on. I've paced top 10 finishers at WS multiple times, and had my own challenging experience at WS finishing in a disappointing 22 hours after being unable to keep food down for several hours. My experience with all this is that the #1 performance limiter in ultra racing is getting fuel to the muscles. And it's my experience that in races over 10 hours, we simply can not absorb sufficient calories to maintain 'race effort'. Part of that is due to physical limits, but just as often it's due to gastro issues and heat issues. Just like I train my body at lactic threshold (Tempo) or V02 max pace, in to achieve system efficiency and improvement, I've found that gradually building up the duration of my depletion/long run, I'm able to increase my bodies utilization of fat as fuel and reduce my dependence on 'supplementation' during racing. I no longer run anywhere close to 100 miles a week–in fact, my weekly average is less than 50, and I only run over 2 hours every other week. Despite that my times at the 50k and 50m are as fast as they were a decade ago. Thanks Mark, that's super helpful. I've always been in the camp of "the pros (of depletion training) don't outweight the cons (of the increased damage and impact on recover)." However, I hadn't thought about it in terms of effectively training for when things go south gastrointestinally in a 100 miler. That to me seems to be the first argument I've heard that's compelling enough to make me consider it. Sometimes I worry that the studies I read don't take the well-read and prepared ultra-runner into account, and I have always lumped depletion training into that. Another one is "you absolutely have to have ~4-1 carbs-protein ideally within 30 min of finishing." I agree that it's helpful, but all those studies seem to be on 'regular' athletes who are not eating during their training. Sure, if you do a 2 hour weight lifting session, then eating right afterwards will help kick-start the recovery process. But if I'm eating in my training run every 30 min, then right when I finish I'm no more than 30 min from having just ingested 150+ calories (and protein considering what I eat on training runs). Yes, I still eat immediately afterwards, but I find it doubtful it's quite as important if you've been eating all along. Anyway, your input is definitely thought provoking for me and I might give it a go to see how it feels. I'd like to add the concept of the "fast middle" long run. My wife Kathy and I have been practicing this approach for many, many years as we build up for our "A" goal races. The concept is quite simple though the execution may vary per individual. Basically we often run from our house to the venue of a local 5-10km road race (often 7-8 miles one way) run the race as hard as we can and then run home. You get a quality long run and some quality speed work in the middle. Sort of teaches you to run fast on tired legs and then also to keep running (easier) after you're tired. Almost mimics what you'd get in a back-to-back weekend running sessions but more compressed. Logistically speaking it's been easy for us to do this since there are so many short races an easy run away from our house. But practically speaking this approach can be easily handled by anybody who'd planned on driving to the venue anyhow; just park a certain distance away and run to and from the venue. This study used a novel approach training each of a person's legs differently and measuring the response within each leg. It noted that the leg that trained twice per day every other day had greater aerobic enzyme concentration and activity than the leg that trained every day. The mechanism is that the leg that trained twice per day performed it's second session in a glycogen depleted state. Granted this study utilized leg extension and not a full body exercise but many use this study to justify glycogen depleted or pre-fatigued workouts (afternoon runs after a morning run or long run the day after intervals). if you are able to take in 300 calories/ hour during a long run after 3 hours you have a 900 or greater calorie deficit (assuming you're burning 600 calories/ hour) that you need to replenish. that's the reason for the 4:1 recovery fuel. Last year when I was preparing for my first 100 miler (Angeles Crest) I ran alternating high mileage weeks in the last 8 weeks leading up to AC. I ran three 100 mile weeks (in 5 sessions, typically 15-20-15 then 30-20) alternating with 25 mile weeks (also 5 sessions). I ran increasing vertical during the high mileage weeks–7k, 17k, 22k. Showed up at the starting line feeling bombproof & rested, and had a great day. I am not a heart rate monitor-driven coach. My clients focus more on perceived effort and/or actual pace rather than the numbers their HRM displays. I find that the variability (that you also mention) between any given athlete on any given day in any given workout can sway greatly from one side of the dial to the other. However, I do often advocate the use of a HRM on easy and recovery days in order to keep the reins pulled in with many clients, especially those new to running or prone to overtraining..
(1)	Marathon effort is roughly 80% to 85% of maximum heart rate (at least in the early miles before dehydration and fuel stores deplete). I think you’ll agree that most folks can hold a conversation in those early miles of a marathon as well. So, to answer your question, easy runs should not be run at marathon effort. (2)	Heat, altitude, and illness can all affect heart rate. You must account for this either by backing off on mileage or pace on your easy and recovery days. If not, you risk a poor performance when it is time to run aggressively. (3)	If you do not recover properly between hard workouts, long runs, and tough racing seasons, you will eventually find yourself injured, burned-out, and/or overtrained. Unless you tend to travel with the Donner Party, you should not have to worry about your body breaking down muscle and other tissue proteins on a two- to three-hour carbo-depleting run. We should certainly practice eating on the run. Hence the reason these runs are done so infrequently and even less-so as race day approaches. Consistency is key to a long and successful running career. Solid training plans feature fluctuating weekly mileage. Most schedules, depending on the individual, should have a third or fourth week where both volume and intensity drop so that the runner can absorb the previous training and then safely take on a slight bigger load in the following two to three weeks. A seasoned runner who jumps from 80 mpw to 110 mpw or an additional ~3.5 to 5 hours/week is aggressive but not unprecedented. That runner should be aware of what to look for in terms of hints of injury and burnout so that that she can back off if problems arise. I've been on a twenty week ultra training plan with back to back long runs on Saturdays and semi long runs on Sundays. Long runs included hills and some trail work. Since I live on the West Coast in a milder region training outdoors year round is fairly easy. I've done three, four hour runs in the past month (taking 2 carb power gels on each) and am now into a tappering stage for the 64 km Burning Boot Ultramarathon June 2nd. Very good info. espec. for us newbies. I'm just wondering if back-to-back long runs are both of the same distance e.g 18 & 18 or if something like an 18 then a 14 would be as beneficial for ultra endurance training. The 50 mile training plan I'm on has back to back weekend runs like Saturday – 22 miles, followed by Sunday 10 miles or Saturday 26 miles followed by Sunday 10 miles. Sunday runs never exceed 10 miles. Thanks for input. All these articles about ultra training are very usefull. Would it be relevant to discuss the importance of putting HIKING into the training plan? Very true! Hiking is a different discipline than running. Personally, I don't practice it often and it shows as on race day I find myself losing ground, comparatively, while hiking as opposed to running. Specificity in your training is very important. As I mentioned in the article, "Training on the same terrain as your race is key…" If you are taking on an event that may require hiking whether you're a front-, mid-, or back-of-the-packer then you should practice that on your long runs. Also, if you're using the hiking breaks as recovery periods (not because of terrain) then you most likely are practicing this on your long runs each weekend. If you practice your racing strategies while training you should be ready come race day.